Quinns: London’s enduring an apocalyptic heatwave right now. I’m typing this with ice cubes taped to my neck, and Paul is lying face-down on the floor. We’re trying to stay hydrated, but liquid just comes flying out of us with the velocity of a water pistol. Paul: I feel like a massive armpit. BUT it has been the perfect time to enjoy games in the sunshine. And then get bitten by everything, ever. Quinns: Trust us when we say we’re in no state to review anything right now. Instead, enjoy a summery summary of what we’ve been playing this month. 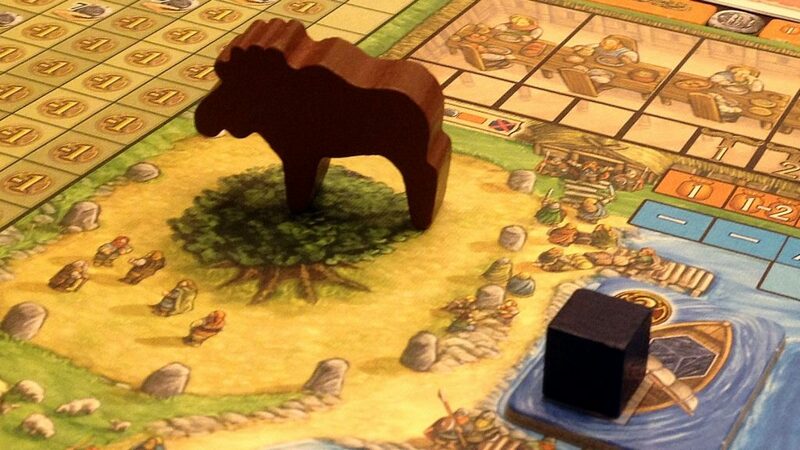 No less than THREE hot new board games, each hotter than the last. Quinns: Fire’s one of the all-time hot things, surely. Paul: I think if we lit a fire in this room it’d actually make it colder. Quinns: Flash Point: Fire Rescue is a co-operative game which is (1) lovely, (2) perfectly nice and (3) PROFOUNDLY UNSETTLING. All the players are firefighters trying to rescue the inhabitants of various burning buildings. You can man the fire truck, chop through walls, hose back the blaze and all sorts of other, heroic actions. And Flash Point is very clear on the fact that heroes DIE. Paul: Flash Point really surprised us, because it’s so much simpler than most of the games we look at, yet almost as mean as legendary co-op horrorshow Ghost Stories. The first time I ever played a game of Pandemic, our team lost within one turn, because of a sudden, random explosion of filthy germs across central Europe. Flash Point can do this to you too, except with random explosions of actual explosions, where your house just erupts in flames, which set fire to flammable thingums, that blow walls down, that burn to death the cat you were trying to rescue. 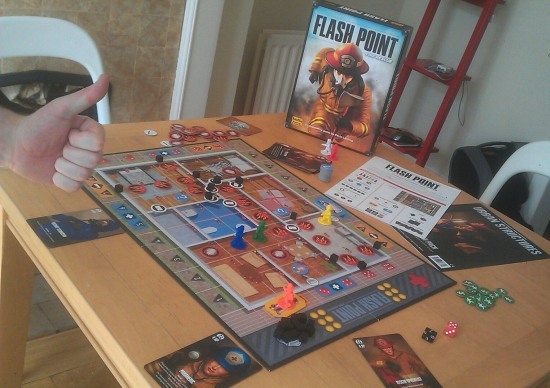 Quinns: We haven’t won a game of Flash Point yet. Paul: A house collapsed in on us. A bed that Quinns climbed onto suddenly burst into flames. A kitchen we entered blew up. Quinns: No, let’s be fair. Our first house collapsed on us. The second saw me demanding that we use the fire truck to put out the fire before we took one step inside, then you, our engineer disposed of all hat inexplicable gasoline in the living room. Remember that? Anyway, that highlighted what an amazing douche canoe this game is. When we were done hosing the building down, it was wet through. So we all boldly tramped in to look for survivors and the house just EXPLODED. If Flash Point teaches you one thing, it’s that fire really does kill. If it teaches you a second thing, it’s that firefighters are forever running back to the fire truck to change their clothes like supermodels in a fashion show. Paul: This is true. Do we like it? Quinns: I think I do. I’m definitely fascinated by it. Let’s play it even more and give it a proper review. Paul: You know what else is hot? The land of the dinosaurs. In history. But also the land of Evo’s fantasy dinosaurs! You know? Quinns: Actually, areas of Evo’s board are extremely hot, but others are extremely cold, or just extremely fatal, according to the whims of the Weather Wheel, which spins every turn and has you, the… dinosaur master? Uh, frantically trying to keep up with it. We should explain the game before people think we’ve done a mental. Paul: Yes. 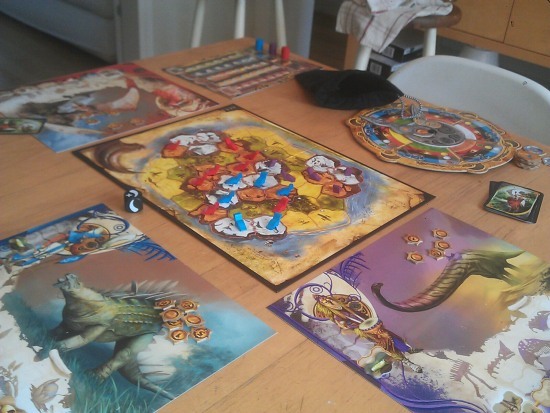 Evo is an area control game all about trying to fill a prehistoric world with your dinosaurs. The more dinosaurs you have grazing across the land, the more points you earn. Every turn begins with the world’s weirdest auction, with players bidding these points on mutations that’ll upgrade their dinosaurs. Maybe a fur coat. An extra leg. Gills. But each turn the world’s climate changes, meaning some territories become dangerous. Quinns: It’s worse than that. Every bit of the board is always becoming hotter, colder, deadlier, leaving your dinosaurs to dance spasmodically on a floor that has less in common with the Triassic era that it does with the disco in Saturday Night Fever. In theory, if you’ve paid for your dinosaurs to be particularly furry or sweaty, they become better at weathering these changes. In practice, every turn is an exhausting puzzle that usually ends with dinosaurs headbutting one another over the last bit of forest. Did you buy horns? Because if you didn’t, your precious wooden dinos are wormfood. Or whatever they had back then instead of worms. Wormosauruses. The key is to keep toughening up your dinosaurs in preparation for whatever the climate may do next, but also ensure they won’t get used as hacky sacks by rival groups of dinosaurs. In a curious bit of design, though, those points you’re spending on mutations? Whoever has the most of them left at the end of the game, wins. Grande but with scales and feral babies. Except we like El Grande. Quinns: Yeah. We don’t like this one. Though Evo’s a game all about dinosaurs, it doesn’t have any heft. You’d never know if from an exploration of the box, with its lovely manual and gorgeous components, but when you’re actually playing? It’s simply not fun. You’re not given enough flexibility in the puzzle of migrating your dinosaurs around, so the players all end up overthinking this slightly unfair and inconsequential challenge, only for the wheel to go in the reverse direction next turn. Paul:And fittingly for a game about dinosaurs, it’s visually impressive and utterly lacking in humanity. 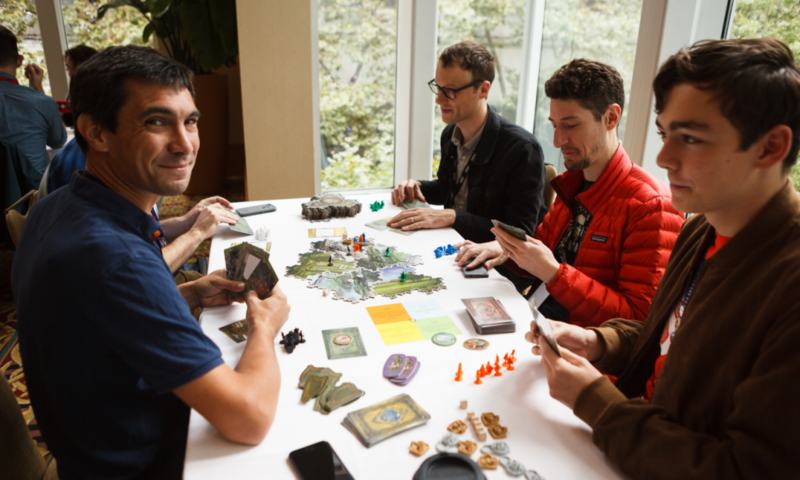 Not only is it not great at rewarding tactical play and planning, it doesn’t make use of the players, the most exciting component of any board game. You just don’t clash all that much. It was okay, but it didn’t do much for us. Quinns: Hm, what else is hot? Paul, what is the hottest thing that has ever existed? Paul: Scientists have proved that microwaved pies are definitely the hottest things ever, but microwave technology is science used for good. The second hottest thing ever is definitely the evil core of a nuclear explosion, which brings me neatly onto The Manhattan Project, which is a game all about trying to explode nuclearly. Quinns: Right. 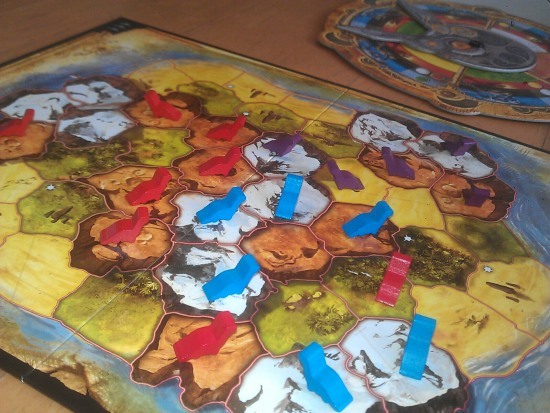 I didn’t play this and I didn’t particularly want to, because it’s a worker placement game. That’s a game of putting “worker” pieces on a central board to steal (or block off) resources before anyone else can get them, then shuttling those goods home. I don’t like how passive those games can feel. Give me something with emotional or psychological frottage, y’know? 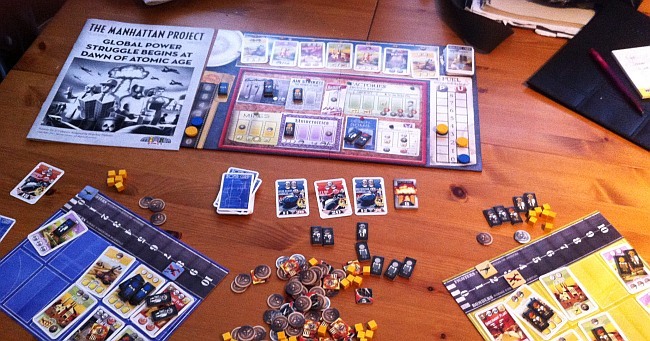 Is Manhattan Project going to make me feel any different? Paul: Well, it might. I think Manhattan Project is good, and it does have players bouncing off each other more than many worker placement games. It has spies. And air raids! Quinns: Go on then, talk about your Agricola with atom bombs. Paul: Each player controls a nation trying to build the biggest and best nuclear weapons, which they can do by, yep, competing to seize resources from a main board, and hopefully they’ll eventually get their own economy going on their own private board, meaning they won’t have to keep trying to elbow their way past the other players and they can enjoy endlessly tinkering with their own creation, watching as it slowly births the fattest bomb the world has ever seen. 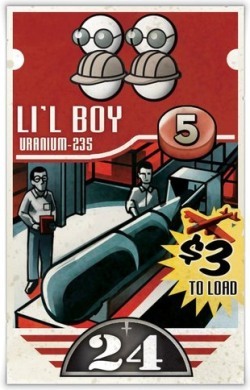 Nuclear midwifery works like this: You grab something from the main board, like a mine that generates the uranium powder known as yellowcake, and you can place your workers in it whenever you want rather than having to compete with anyone else. Get yourself your own university, which provides you with educated workers, your own mine and your own reactors, and screw what anyone else is doing on the main board, you’ve got your own, deadly economy going that you’re invested in, engrossed in. Quinns: That sounds even more self-involved. Like the game would be mostly watching other players mumble to themselves while they rearrange the contents of their shorts. Paul: Uh… Well! There’s two mechanics in the game that I think are particularly interesting. First, the planes you build and the spies you use let you interfere with the other players directly. Bombing raids can ruin their day, or you can use your spies to infiltrate their board, using them as if they were your own, thieving their resources, exploiting their education programs. It’s devious. Quinns: Oh god. It’s worse than I thought. It’s everybody being antisocial and playing a game on their own, private board, but with the option to be even more antisocial by ruining someone else’s construct. Quinns: But you did mention something I quite liked. It costs you an entire turn to retrieve all your workers? Quinns: -For being even more of a passive-aggressive, hand-in-your-pants jerk, just like we said we didn’t like people being in these games. So it’s not a massive spin on worker placement, is it? Paul: It’s has significant spin, like a bouncing bomb. It’s engrossing and it requires you to pay a lot more attention to other players and then leap on what they’re doing. But you’d definitely call it navel-gazing, since you get so excited about what you’re up to, your own plans and schemes, what you’re going to do. Quinns: That is pretty navel-gazing, yeah. Quinns: Right then! Well I suppose that concludes our searing hot summer roundup of the sizzling gaming experiences we’ve been enjoying these last few weeks! Paul: I am covered in insect bites. Quinns: That was probably Hive. 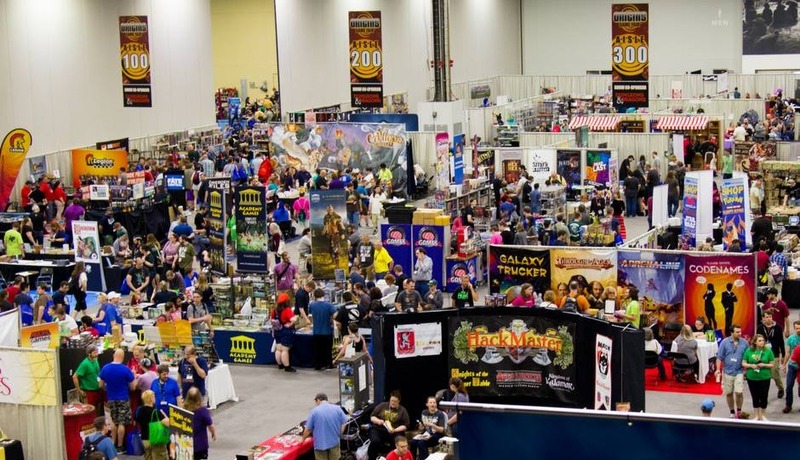 Our Top 8 Board Games from Origins '17!